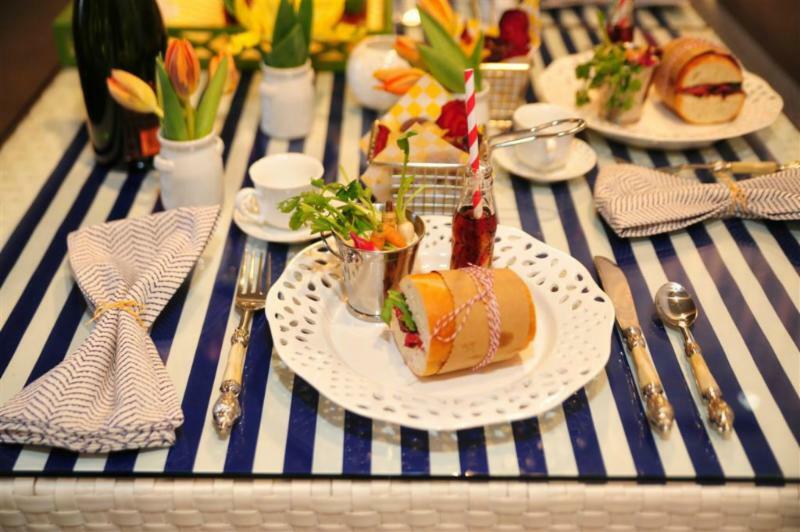 Ready for a Hamptons' picnic? 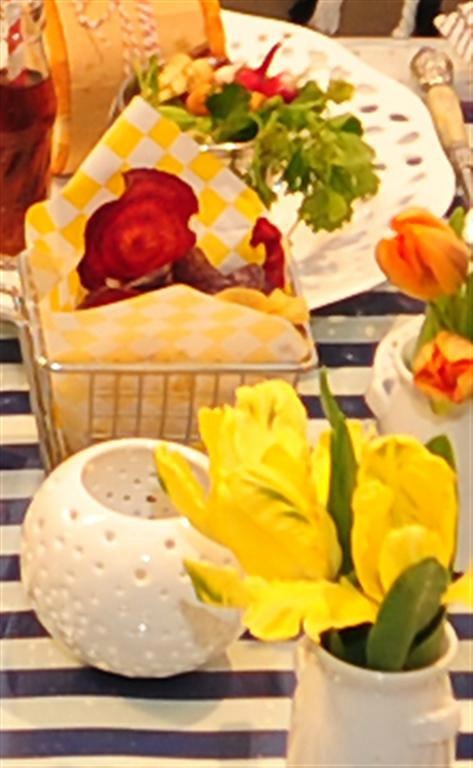 We laughed over lunch when the team from Boutique Bites, Elaina Vazquez, Jen Nordstrom and Kim Schiller tied fashion in with food so much the name of their table became a "Chicnic". They customized our white woven modular furniture with their own pillows and throw. 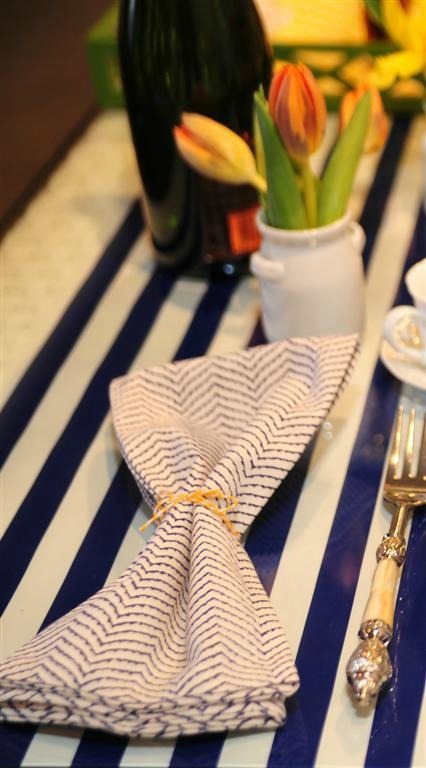 They also were able to customize our white woven coffee table in a surprisingly simple way: they put a layer of blue and white striped wrapping paper under the glass. Owner Elaina's love of fashion and her flair for coordination was on display when she came to our showroom wearing a matching navy striped scoop neck sweater to compliment the nautical inspired theme. Boutique Bites certainly has a well-deserved reputation for incorporating miniatures into their menus. Notice here they found multiple uses for our mini vessels: our mini cola bottle for beverages, our mini white jug for flowers and our stainless handled pail for mini root veggies. 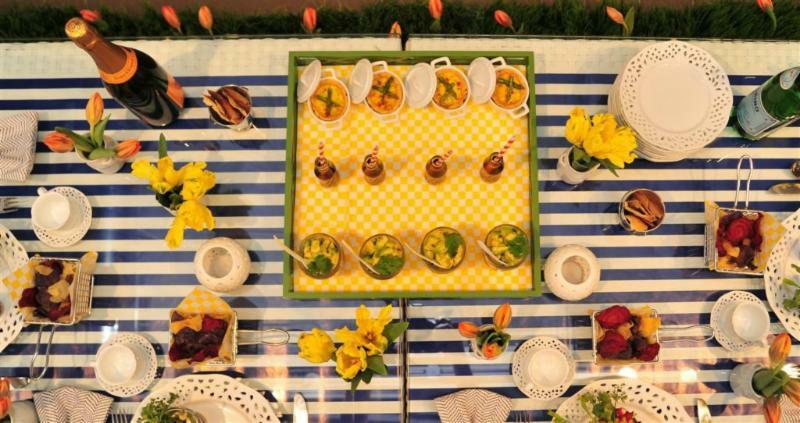 They also incorporated miniatures throughout their entire table ultimately using a total of nine different mini vessels. 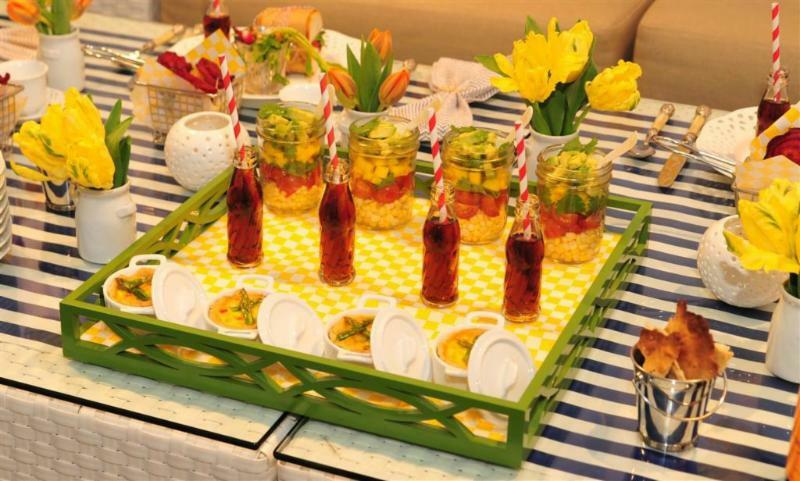 Not all of their parties incorporate what they call their "stylish minis", although they love the current trend away from full buffets and toward "food stations" or "small plate" stations. Regardless of current trends, they always start with the focus on food since Elaina started as a chef. In preparation for creating proposals, they have weekly brainstorming sessions, something they highly recommend for other companies. They call it their "safe zone" in which their team of five people feels free to bounce all ideas among themselves no matter how farfetched. It is their way to keep the creativity and inspiration flowing. Where did their inspiration start for this vignette? Elaina confided that the Hamptons vision has been living in her brain constantly since she is in the midst of build-out for her new kitchen complete with a private dining room called Brique. She said she is creating it with "an East Coast cool vibe, but with an extremely welcoming and warm open kitchen". 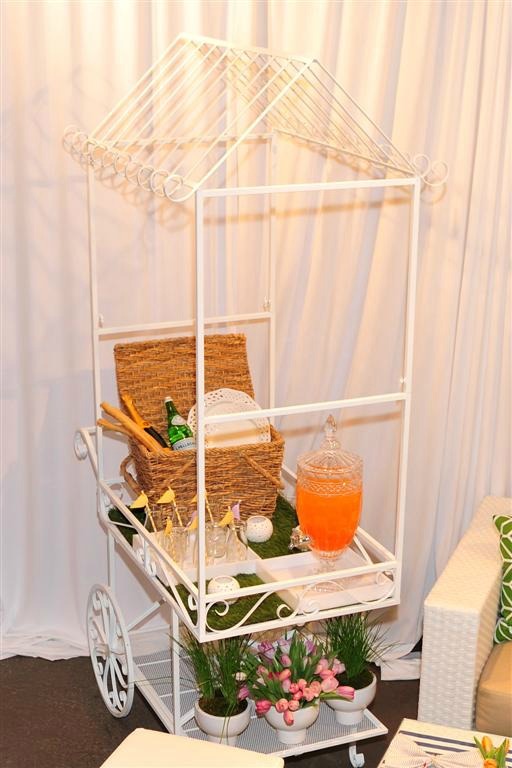 To create that look in our showroom, not only did the casual white woven furniture with white seating cubes pop out to her, but so did our One of a Kind White Flower Cart which has recently been modified to enhance its functionality. She chose the taller optional top, but not the extra lighted shelves. She wanted space to highlight the casual feel of the picnic basket. Our cut crystal beverage urn was added for a nice juxtaposition. 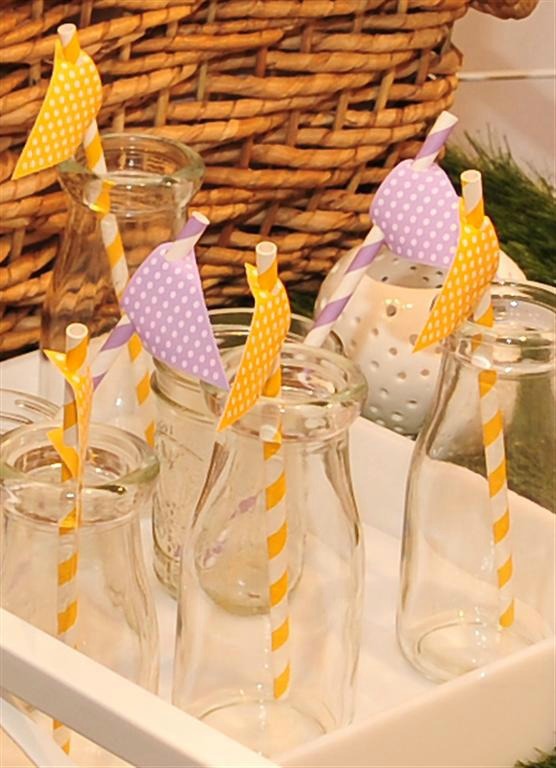 Elaina's attention to detail is highlighted by the yellow check accents which show up in the tiny ribbon napkin tie, the tray liner and the paper liner of the stainless mini basket, all of which are complimented by the yellow straws and flags for their specialty drink. they may be all about food, but fashion and design details are not too far behind. 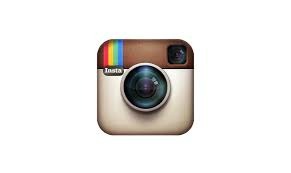 Check out their blog entries entitled Food & Fashion Friday and their video, Fashion to Fork. Their parties may start with food, but with Elaina, "Commander in Chic", fashion and design will always play an important role. If the photos have a familiar feel this month, it is because John Zouras of John Zouras Photography, shot the pictures. We know him well because he has photographed every picture (and there are thousands of them) currently on our website. Although we have kept him busy during the week with all of our product shots, his weekends are filled with weddings. You may reach him at 847-716-0434.